Something to say, to celebrate, to inform. Such is editorial writing. I have been fortunate to find a stable of magazines and websites which have a similar view (and always … would welcome more). 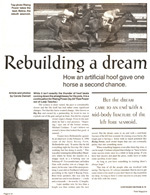 While many of the latest publications have been about horses, my work is not limited to them. Love to do personalities, activities, projects and informational work. Reasonable, will travel. Interested in publications which accept electronic submissions only. Photos always accompany articles. 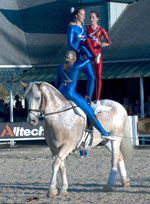 Expectations are high in the vaulting community for the 2010 Alltech World Equestrian Games at the Kentucky Horse Park. American vaulters have always medaled at WEG and spectators at the Lexington site should expect history to repeat itself. The players are experienced, dedicated and ready. Teams are gearing up. From lifts, handstands and leaps, horse and vaulters move with fluid beauty through the air in defiance of gravity. At the trials, judges will be looking for a balanced forward horse, with vaulter grace and fluidity, risk and stability as well as that unique creative spark necessary to capture gold in Kentucky for American Vaulters. To come along on the journey, check this page often for the latest news. Take a number of Silver and Gold Medal Vaulters from across the country, add a couple or three horses from somewhere else, stir in some music and choreography,give it a quick mix for one or two days. 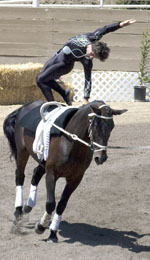 Stir in a steady circle and present to an audience of amazed people.You can do THAT on a horse? 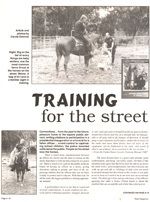 A quick look at the American Vaulting Association's premier demonstration group. An ever changing roster of gold and silver level vaulters, their horses, lungers and a story to tell about the totally fun equine sport of vaulting — gymnastics/dance on a cantering horse. jockeys never sit down. So there is a reaction to the weight that's not up on the withers. All the regular tools that even an experienced rider can employ are not effective until the horse understands the difference, becomes accustomed to the newness of position and requests. That takes time, it takes patience, and it takes a sensitive understanding of how to make those differences in the job clear to the [ex-race] horse in a way that he or she can assimilate, understand and respond to, instead of react. The Thoroughbred is a bit hotter in that they're not going to put up with a lot of [even unintentional] abuse." every time an administration wants to drop a mounted patrol unit, the business community steps in and says no. You can't do that. We're downtown. We help bring a positive family atmosphere. People feel safe."